Frank W. Hopkins was a cement contractor who lived in Long Beach at 431 Bonito Avenue with his wife Margaret. He poured the pavement shown above on March 29, 1924. Mr. Hopkins followed a circuitous route to Long Beach. Born in England, he arrived in Québec, Canada, on his way to British Columbia. From there he went to Oregon, and then travelled to Long Beach where he lived for about five years, according to city directories. By 1930 he was residing with his family in the Echo Park neighborhood of Los Angeles. Address Source: Long Beach City Directory 1923; Western Directory Company: Seaside Printing Co., Long Beach, California, ©1923. RESEARCH TIP: As your Blogger has mentioned before, don't put off photographing important sites in your town. 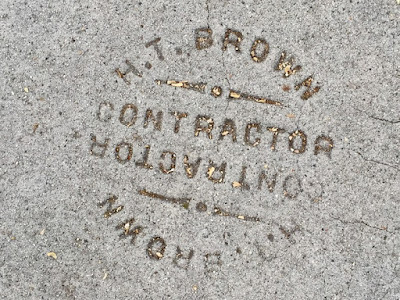 The picture above was taken only a few weeks ago, and today this “sidewalk signature” is gone for good, recycled into concrete rubble which will lie under new cement sidewalks when the California Heights repaving project is completed. If you read yesterday’s post and found a Revolutionary War pensioner on “page two” of one of the 1840 U. S. Censuses that you had in your files, get ready for more information! 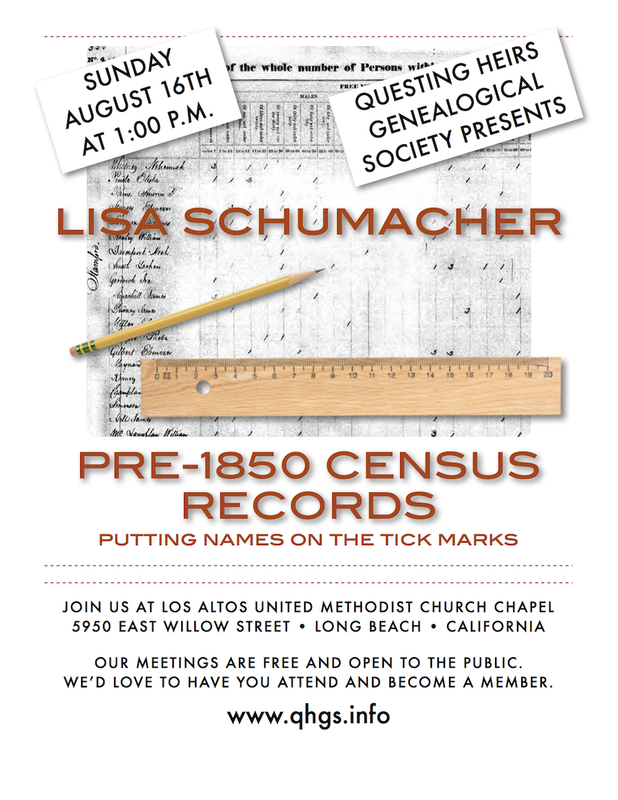 The first class at our August 16th meeting will show you how to uncover other gems hidden in Pre-1850 censuses. 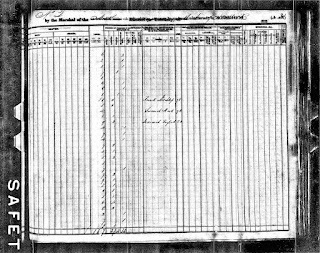 The 1840 U. S. Census: But Wait—There’s More! The 1840 census is an especially valuable resource for genealogists because, on page two, it asks for the names and ages of “Pensioners for Revolutionary or Military Services [this includes War of 1812 pensioners], Included in the Foregoing [Household].” The term “Pensioners” refers to both veterans and widows. 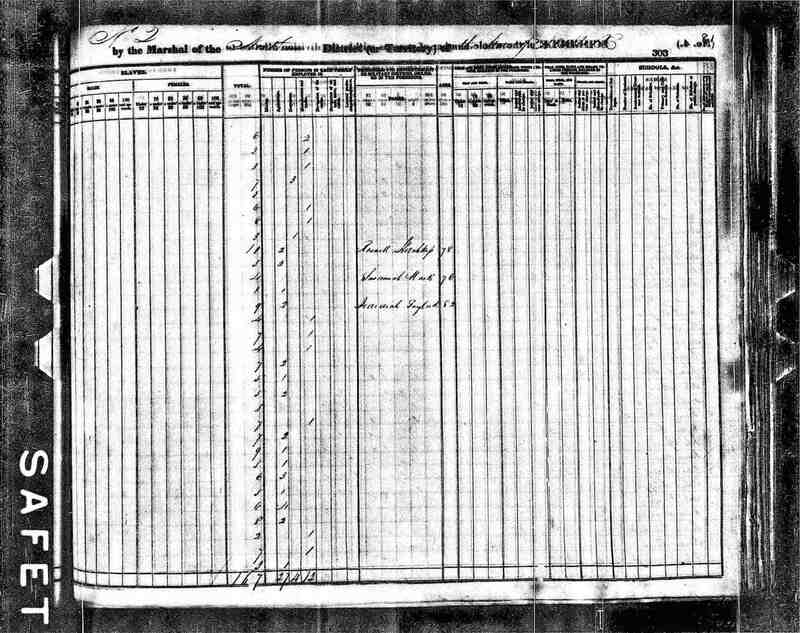 For more information about page two of the 1840 Census go to http://www.archives.gov/research/census/1790-1840.html. You may also be able to find your pensioner(s) in the 1840 Census of Pensioners which was published in 1841. A transcription is available online at http://www.accessgenealogy.com/military/1840-pensioners-census.htm. RESEARCH TIP: Don’t settle for just half of the story. Look at the second page of ship manifests, censuses, WWI draft cards, border crossings, and vital records. 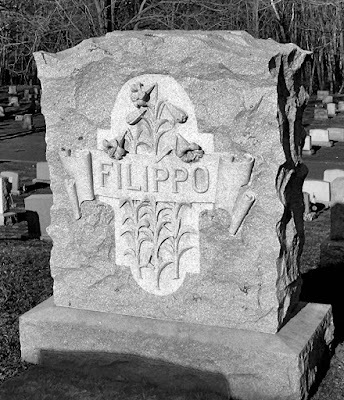 Turn photographs over to search for clues, and always examine the back of a tombstone—you’ll be glad you did! In 1992, QHGS published a Society Cookbook. It was not a simple project to undertake, but the results were definitely worthwhile. RESEARCH TIP: Look for old society cookbooks online, in antique malls, and at swap meets and garage sales. They may contain memories of times past as well as information about your ancestor’s church friends and/or club buddies. You might even find a relative’s recipe in one of them! In the Find A Grave index for Long Beach Municipal Cemetery, H. J. Foot/Foote is listed twice—once under “Foot” (because that is the spelling on his grave stone), and once under “Foote” (probably because that is the spelling used on his death certificate and in his obituary). To compound these spelling woes, his stone is one of the fallen, flush to the ground, and the inscription is rather difficult to read. 1. To establish the fact that Heman J. Foote served in the Union Army, we went online and consulted the National Parks Service’s “Soldiers and Sailors” page at http://www.nps.gov/civilwar/soldiers-and-sailors-database.htm. The search for him there took several tries with alternate spellings, finally producing results when a minimal amount of information (“Foote” and “113th”) was entered into the search boxes. The reason it was was difficult to find Heman is because he is listed as “Henry J. Foote” on the National Park Service index. 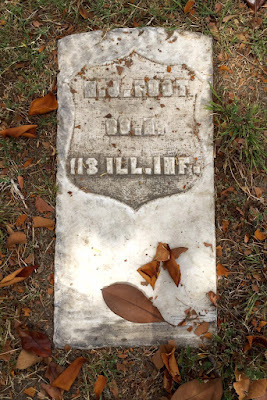 To discover more we looked at the FamilySearch Wiki’s “113th Regiment Union Illinois Volunteers” page at https://familysearch.org/learn/wiki/en/113th_Regiment,_Illinois_Infantry. In that source, he is listed as “Heman J. Foote,” as he is on almost every other Civil War document. “Heman J. Foot filed for a Civil War pension in Illinois on 5 September 1892 as an Invalid. His widow, Mary, filed for a widow’s pension on 8 May 1905 in California. 3. Heman is not listed in the “1905-1939 California Death Index,” so we used death date information in the obituary posted on Find A Grave to locate a digitized image of his death certificate on the FamilySearch website at California, County Birth and Death Records, 1800-1994, index and images, FamilySearch, Los Angeles, Long Beach > Death certificates 1904-1911 no 1-140 > image 305 of 2542. The three sources cited above create only a bare outline of Heman J. Foote’s life. To find out more about him—to make his story “come alive”—we can use U.S. Census records to trace his journey from Ohio to Illinois and thence to Long Beach, California; we can find out when he married Mary; and we can read more about the 113th Regiment Illinois Volunteer Infantry at http://www.nps.gov/civilwar/search-battle-units-detail.htm?battleUnitCode=UIL0113RI and https://familysearch.org/learn/wiki/en/113th_Regiment,_Illinois_Infantry. RESEARCH TIP: Don’t fall into the trap of thinking that there is only one “correct” way to spell your relative’s name. Use alternate surname and given name spellings when you search for your ancestors, and you will have more successes and fewer brick walls. 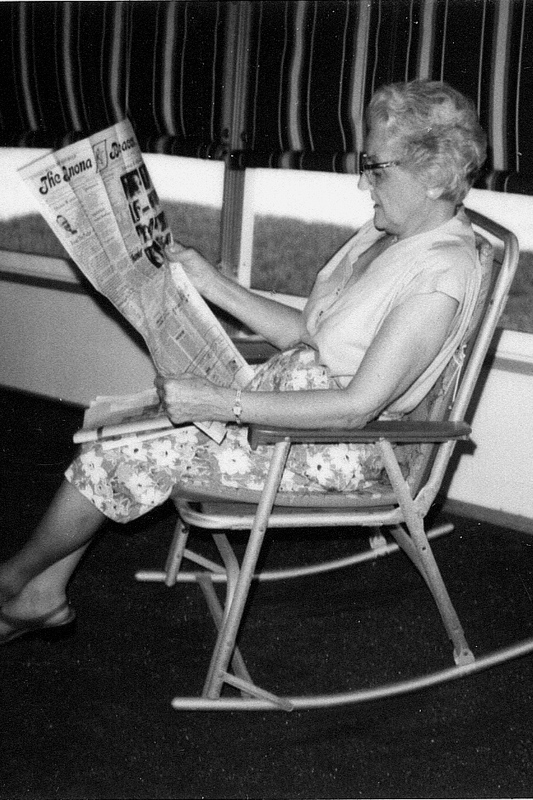 Old newspapers are one of the best sources of information about everyday life in the past. Several websites where Southern California newspapers can be accessed at no charge are listed below. The Torrance Public Library has made available on its website a collection of resources related to the city’s history. The newspaper database covers the period from 1913 through 1969. The database includes the following newspapers: The Torrance Press, originally The Peninsula Press (1949–1964), and The Torrance Herald (1914–1969). Click on the link in the search results to open a full-page image of the original newspaper in PDF format. Start your research in these papers at http://www.torranceca.gov/libraryarchive/. The Whittier Newspaper Collection contains digitized issues of various Whittier newspapers dating back to February 23, 1888: the Whittier Daily News, the Whittier Register, and the Whittier News. Access this collection at http://digi.whittierlibrary.org/wpl/index.html. The California Digital Newspaper Collection is a project of the Center for Bibliographical Studies and Research (CBSR) at the University of California, Riverside. This collection contains 72,729 issues comprising 603,681 pages and 6,876,356 articles. It is a freely accessible repository of digitized California newspapers from 1846 to the present. You may search by newspaper title, by date or by subject. At present there are 53 newspapers featured. This site is especially good for researching the San Francisco Bay area pre- and post-earthquake. It also has an excellent collection of papers from Sacramento which often reference San Francisco events. Access these newspapers at http://cdnc.ucr.edu/cgi-bin/cdnc. RESEARCH TIP: If you cannot find articles about your ancestor in his “home town” paper due to fire, flood, or other disaster that may have destroyed the copies you need, try looking in a nearby town’s newspapers. For example: early 1900s editions of San Francisco papers are difficult to find due to the 1906 earthquake and fire which destroyed many records. However, papers in Sacramento often carried news from surrounding cities, and San Francisco births, marriages and deaths were often listed in editions of the Sacramento newspapers. Don’t be afraid to branch out—you may find just what you’ve been looking for in the next city. This family tree shows the ancestors of Sigmund Christoph von Waldburg-Zeil-Trauchburg, Bishop of Chiemsee. Sigmund Christoph was born in 1754 and he died in 1814. 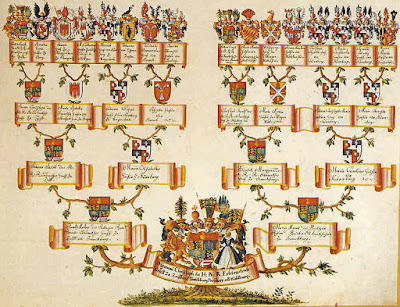 Unlike the family trees we have looked at on previous Saturdays, this one shows no ancestor portraits; rather, it concentrates on Sigmund’s political lineage, illustrating the coats of arms and insignias of his relatives. RESEARCH TIP: Get away from your computer for a few hours and chart your pedigree using pencil and paper. Whether you design your own family tree or use a pre-printed ahnentafel chart, the act of writing your ancestors’ names, one-by-one, may create a meaningful experience for you and provide a deeper connection to the past. 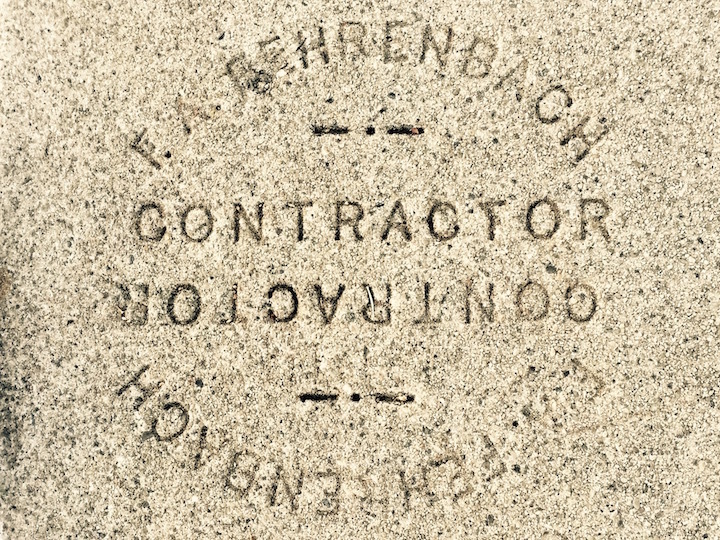 Francis A. Fehrenbach was a cement finisher and contractor who lived in Long Beach at 1157 Lewis Avenue in 1923 with his wife Adelaide Albers Fehrenbach. RESEARCH TIP: Don’t put off photographing city monuments in your town, thinking, “Oh, they’ll always be there.” As your QHGS Blogger types this, the curbs and sidewalks of her street are being torn apart by a massive city re-paving project. 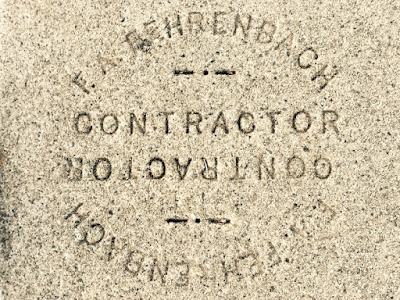 Many contractors’ impressions from the 1920s will be lost when this project is completed, but fortunately, photographs of their “sidewalk signatures” will survive. 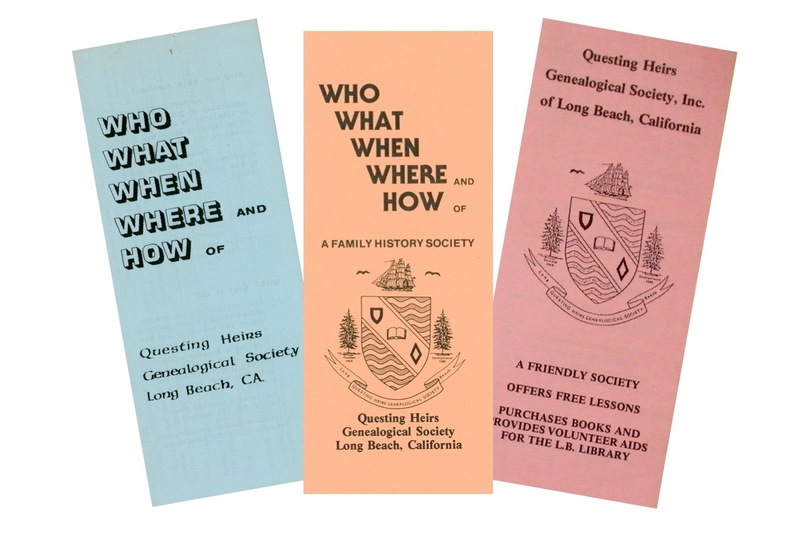 QHGS belongs to the California State Genealogical Alliance. Do you make good use of its online resources at the CSGA website? Open the CSGA home page at http://www.csga.com/ and click on the word “California” to access statewide resources. Do you want research instruction? Go to the menu bar and select “CA Research Aid.” You will see 12 links to open for more help: California Counties, Statewide Research, California Wiki, CA Research Guide—Intro, Birth and Marriage Research, Death Research, Directories, Land Research, Library Research, Maps, Naturalization Records, and Newspaper Research. Interested in a specific county? Click the county of your choice on the state map, and you will find information about the county itself as well as links to libraries, archives, newspapers, maps, land records, vital records, and genealogical societies in that county. Don't overlook the CSGA Blog at http://www.csga.com/Blog/. It has current genealogical news, links to many otther genealogical society blogs, and a wonderful series of illustrated articles called “FDR’s Alphabet Soup, Records of the Great Depression,” by Cath Madden Trindle. RESEARCH TIP: If your ancestors came to California from another state (and chances are, they did! ), be sure to look for unusual resources listed on that state’s genealogical society website. For example, the Wisconsin State Genealogical Society and the Illinois State Genealogical Society offer free webinars for everyone—not just for their own members—and many of the webinars focus on genealogy problems and opportunities researching in that particular state. Last year, on June 29, 2014, QHGS member Penny Nugent purchased an old photograph album at the Long Beach Antique Market. A composite photograph labeled “Class of 1922” (shown above) was pasted on its title page. Every photo had first names written in ink on the image, and, while a few of the pictures gave relationships like “Aunt Lucy,” and “Uncle Clark,” the majority had “me” or “myself” written on them. Only one item gave any indication where the album might have come from: a photo postcard of the Washaura County Normal School in Wautoma, Wisconsin. Using that information as her first clue, Penny decided to proceed as though the album were a genealogical mystery that could be solved. Her goal would be returning it to a living relative, but first she had to discover whose family photos had been preserved with such care—who was the young woman labeled “me,” “myself,” and “I”? June 30, 2014: Because no surnames were recorded on the pages, Penny listed all of the first names that were written on the photos, making tentative assumptions about possible relationships as she did so. 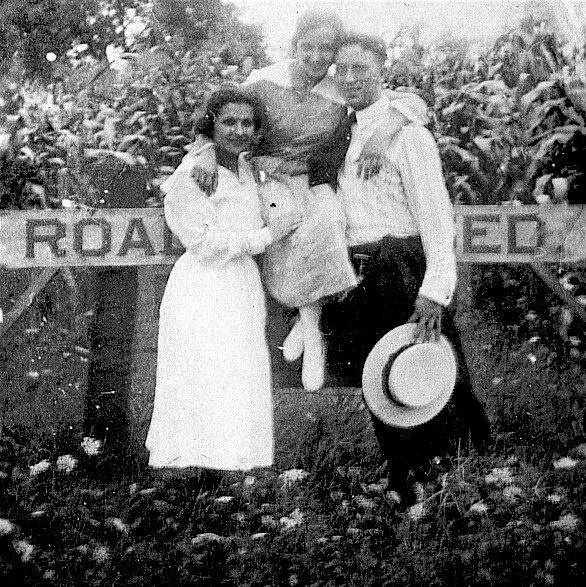 Many pictures showed an “Edward” and a “Sally.” Comparison of all the Edwards showed that they were the same person, but the Sally was not “myself,” The most common photo caption was “myself and Eddie” or “Edward and I.” Two of these pictures were of the subjects at age 10 and at age 20, thus, there was a possibility that the “me” was Edward’s twin sister. It was time to look at census records. July 1, 2014: “Edward” and “Sally” are common names; so, Penny searched the 1920 census in Waushara County, Wisconsin, using the names of “Aunt Lucy and Uncle Clark.” It did not take long to find the only couple in the county with those given names: Lucy and Clark Berray. Nor did it take long to find out Lucy’s maiden name, Ceman, on FamilySearch.org. Sure enough, a Ceman family was living near the Berrays—a Ceman family with two children, named Eddie (15) and Mary (14)! This family also had a daughter Genevieve (10) and son Clifford (3), both of whom appeared in the album. July 2, 2014: Fortunately, there was a well-sourced tree for this Ceman family on Ancestry.com. 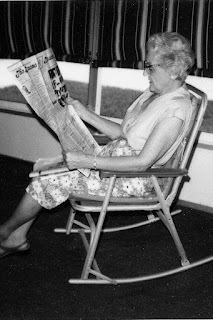 After sending the tree’s owner a description of the photos, Penny continued to search newspapers and directories for more evidence that Mary Ceman was the album’s creator. When she found documents showing that Mary’s brother Eddie had married Sally A. Thorsen, she was sure. On July 3, 2014, a very excited Lorene Seman (note change of surname spelling) contacted Penny; and, after several email exchanges, on July 5, 2014 the photo album that Mary Ceman had created c. 1925 was mailed to her distant cousin in Wisconsin. RESEARCH TIP: Swap meets and garage sales offer many items that you can use to improve your research skills. Not only will you learn a lot by tackling a project like this, you may reunite photos of ancestors with a descendant’s family! In 1980, after a decade of using mimeographed typewritten pages to record information about incoming members, the QHGS board decided it was time to create a membership brochure that could be passed out at seminars and distributed to libraries. Graphics played the biggest role in brochure design, typefaces were very important, and it was almost impossible to create a professional-looking product at home during pre-computer days. Nevertheless, QHGS managed to print and distribute brochures that explained our club’s educational goals and encouraged people to join our Society. 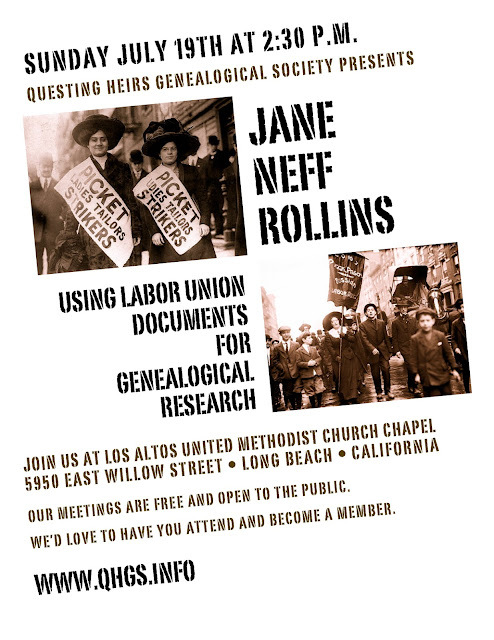 RESEARCH TIP: Did your ancestor belonged to an organization? Perhaps you can find its membership brochure for sale on eBay if you don’t already have a copy. eBay is a great place to find ephemera that will flesh out your ancestor’s story. 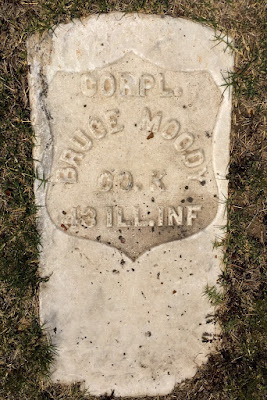 Although Bruce Moody’s death certificate indicates that he was buried in Sunnyside Cemetery, his grave stone is located in Long Beach Municipal Cemetery, Lot 88, Blk E. It is one of the “fallen” stones, flush with the ground. Find A Grave’s website has entries for Bruce Moody in two Long Beach cemeteries: Municipal and Sunnyside. These cemeteries are side-by-side and somewhat difficult to tell apart. No dates of birth or death are in the Find A Grave Municipal listing, but full genealogical dates, mother, father, sibling’s names, and reference to his spouse are in the Find A Grave Sunnyside listing. 1. To establish the fact that Bruce Moody served in the Union Army, we consulted National Park Service. U.S. Civil War Soldiers, 1861-1865 [database on-line]. Provo, UT, USA: Ancestry.com Operations Inc, 2007, and Historical Data Systems, comp. U.S., Civil War Soldier Records and Profiles, 1861-1865 [database on-line]. Provo, UT, USA: Ancestry.com Operations Inc, 2009. 2. To find out if Bruce was a Civil War pensioner, we looked for him in the National Archives and Records Administration. U.S., Civil War Pension Index: General Index to Pension Files, 1861-1934 [database on-line]. Provo, UT, USA: Ancestry.com Operations Inc, 2000. 4. 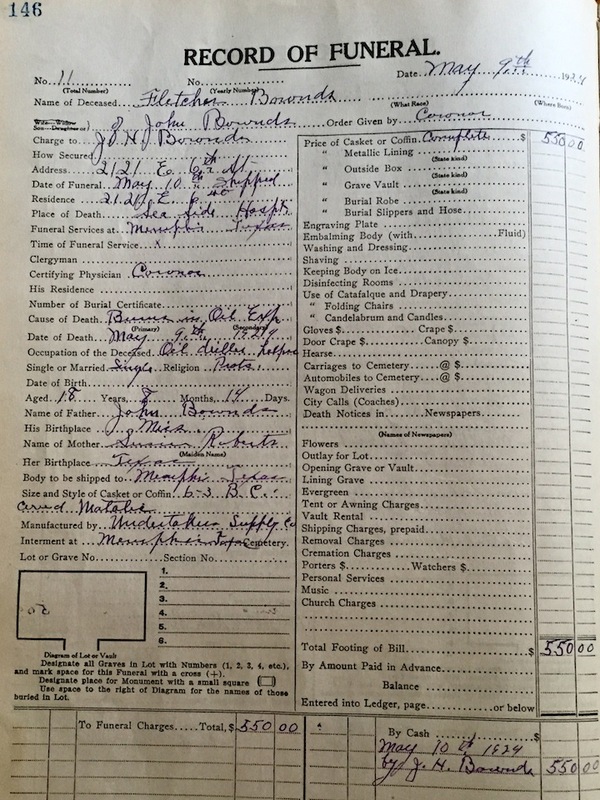 And, using information from source three, we located a digitized image of Bruce’s death certificate on the FamilySearch® website at California, County Birth and Death Records, 1800-1994, index and images, FamilySearch, Los Angeles, Long Beach > Death certificates 1921 nos. 600-900 > image 84 of 326. RESEARCH TIP: Find A Grave is a wonderful resource, but it is only a tool for genealogists to use, and it doesn’t always have accurate information—after all, data on it is provided by human beings, and errors can creep into entires. 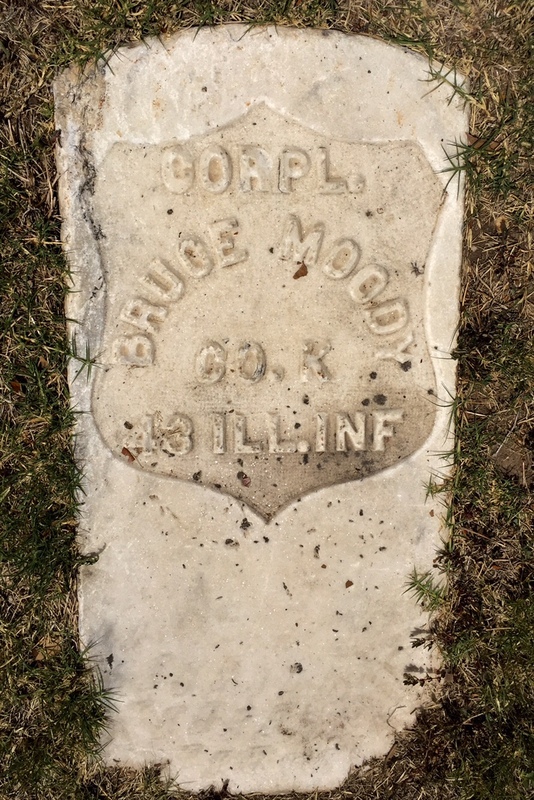 Because of conflicting information: a grave stone found in one cemetery; a death certificate that lists another cemetery as the burial place; and, listings in two different cemeteries on Find A Grave, more research needs to be done to “prove” the actual resting place of Bruce Moody. Cemetery card indices need to be searched at both cemeteries, and newspapers need to be consulted to see if Bruce’s obituary and/or funeral announcement sheds any light on his place of burial. The QHGS Blogger thinks it is much more likely that Bruce Moody is buried in Long Beach Municipal Cemetery than to assume the death certificate is correct and that he is buried in Sunnyside. Why? Because Bruce’s wife’s grave stone is next to his stone in Long Beach Municipal Cemetery. The inscription on her monument reads: “Mother Sallie A. Wife of Bruce Moody” above the dates of her birth and death. However, a hunch like this is not enough! When conflicting evidence is present, all avenues of research must be explored exhaustively. Do you have an ancestor who simply cannot be found? You think you’ve looked everywhere, examining census records until your eyes are sore, and still that one particular person remains hidden. Sometimes we genealogists feel like giving up, but there are research strategies that will help us find our “invisible” relatives. Several websites which discuss these procedures are listed below. Visit the New York Public Library online at http://www.nypl.org/blog/2011/08/03/genealogy-research-tips to learn alternate ways of looking at your research problems. At https://familysearch.org/learn/wiki/en/Solving_Tough_Research_Problems%E2%80%94Overcoming_Brick_Walls the FamilySearch WIKI will help you discover techniques to push your inquiries into new, “never-thought-of-that-before,” areas. On her world-famous “Cyndi’s List” website, Cyndi Ingle has a list of articles that tell us what other genealogists have done to solve their problems: http://www.cyndislist.com/brickwall/articles/. RESEARCH TIP: Brick walls are inevitable, but they needn’t put a stop to your research. You can go around, under, and over many brick walls by setting your direct ancestor aside to research other members of the family—what genealogists call collateral lines—because brothers’ and sisters’ records may provide the information you are looking for. 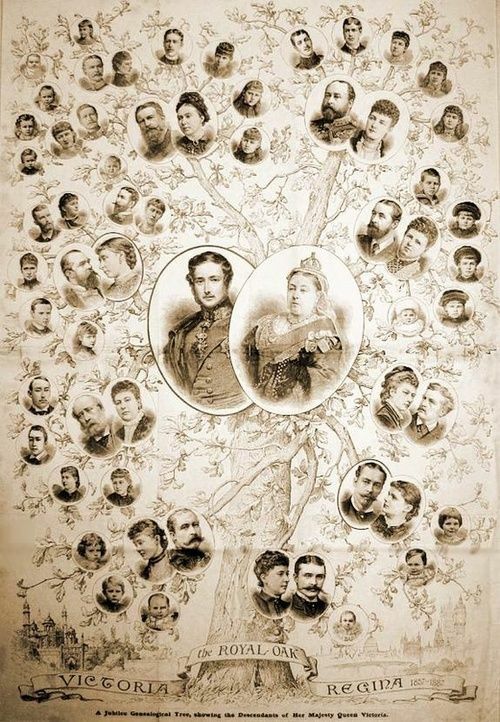 This descendancy chart was probably created to honor Queen Victoria’s Golden Jubilee in 1887. RESEARCH TIP: Find out how many different charts your computerized genealogy program can make, and print out one of each. Looking at the “same old information” from a different point of view may solve a persistent problem, reveal a new relationship, or even expose an information input error. 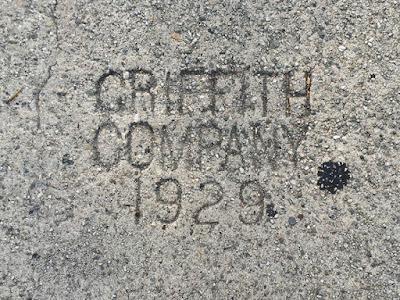 Did one or more of your ancestors work for Griffith Company when it paved the streets of Long Beach during the 1920s? If you have relatives who were employed by this firm, you will be happy to learn that the company is very proud of its history and that a large section of its website is devoted to company projects constructed during the last 100 years in Southern California. 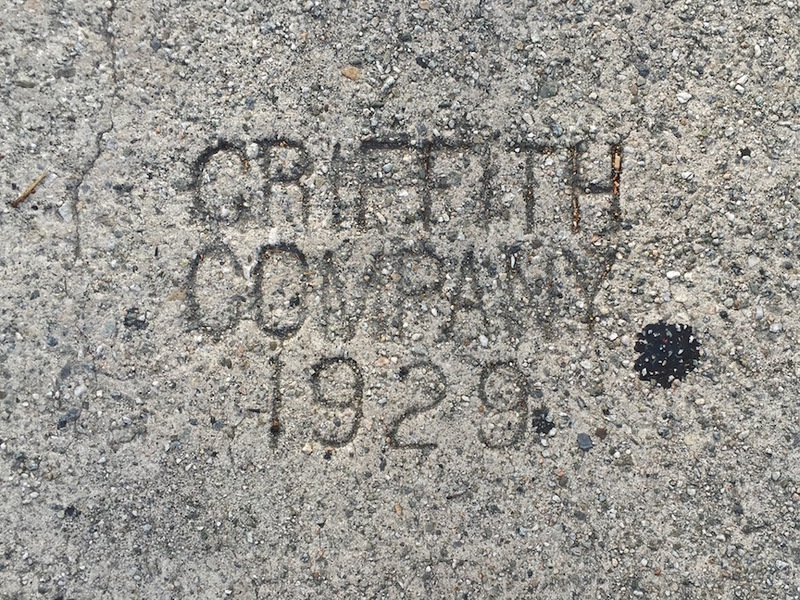 You can find historic photographs and descriptions of various Griffith Company projects from the 1900s to the 1950s—roads and bridges, airports, waterworks, communities, military—at http://www.griffithcompany.net/history.php. RESEARCH TIP: Many firms are interested in their own histories. Some even have company historians. Researching corporate archives at your ancestor’s place of employment may yield new information for your genealogy! 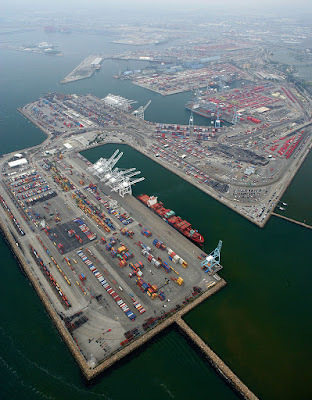 A decade-by-decade overview of the Port’s history is at http://www.polb.com/about/history/. The Long Beach Harbor Commission’s history and a list of Port Commissioners with short biographies and pictures is available at http://www.polb.com/commission/commissionhistory.asp. 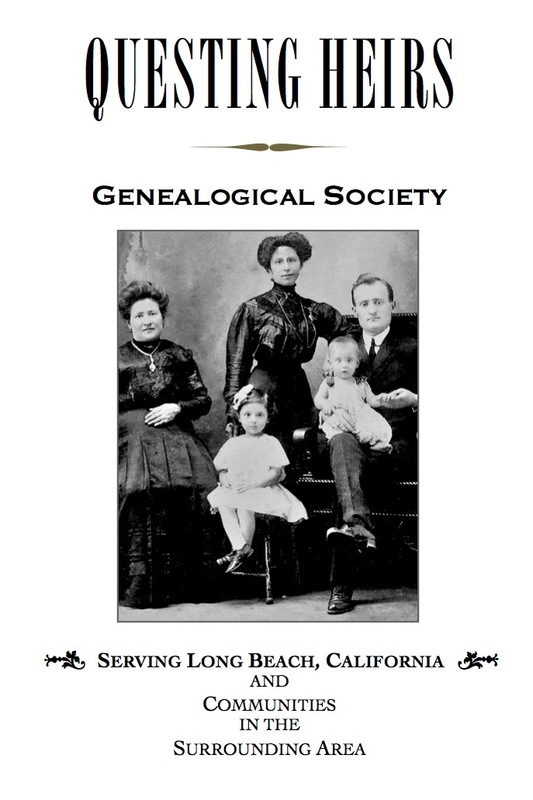 Whether developer or laborer, your ancestor may be mentioned in this book: Port Town: How the People of Long Beach Built, Defended, and Profited From Their Harbor, by George and Carmela Cunningham. Order a copy at http://www.amazon.com/Port-Town-People-Defended-Profited/dp/069246848X. RESEARCH TIP: On August 7, 2015, the Historical Society of Long Beach will open a new exhibit of historical photographs featuring the Port of Long Beach. Visit the installation, examine the photos, and see how many people you can identify in the pictures. In late 1980, QHGS began operating as a 501C3 nonprofit corporation at the state and federal level. The signing of final papers on November 12, 1980—representing two years of hard work by the QHGS executive board and the QHGS legal committee—was commemorated by nine photographs. 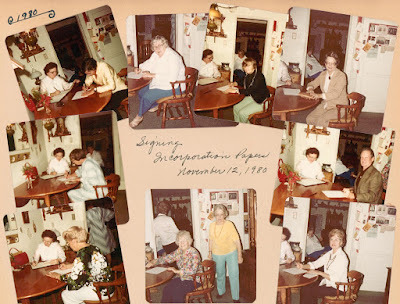 Signers included: Naydean Updike, President; Maurine B. Seely, Recording Secretary; Pearl H. Sager, Treasurer; Bonnie E. Rallston, Corresponding Secretary; Margaret Byrkitt, Parliamentarian; Myrtelle W. Molyneaux, Education Chairman; Marian E. Beall, Hospitality Chairman; Walton M. McNulty, Refreshments Chairman; Eloise C. Reed, Membership Chairman; and Virginia Brown Zunich, Incorporation/Legal Committee Chairman. Questing Heirs continues to operate as a nonprofit corporation today. 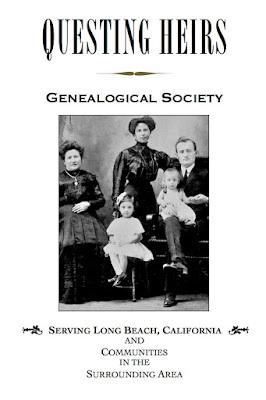 We are dedicated to furthering genealogical interests, teaching good genealogical practices to beginners, and offering educational opportunities to everyone interested in finding out about their family history. Our monthly meetings and classes are free and open to the public. 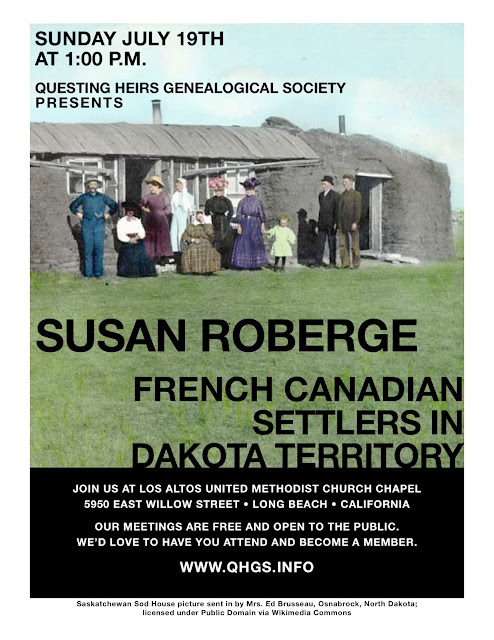 Please join us as we help each other discover ancestors, trace migration patterns, and learn ways to overcome our research problems. Freeman D. Briggs’ grave stone records his birth and death years and notes his service in the U. S. Navy. 1. 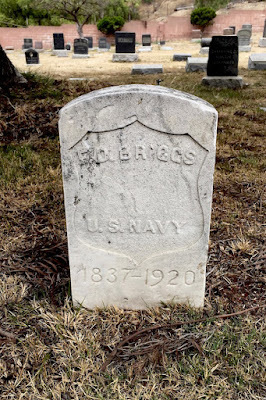 To establish the fact that Freeman D. Briggs served in the Union Navy, we consulted U.S., Naval Enlistment Rendezvous, 1855-1891 [database on-line]. Provo, UT, USA: Ancestry.com Operations, Inc., 2014. 2. To find out if Freeman was a Civil War pensioner, we looked for him in the U.S. Navy Pensions Index, 1861-1910 [database on-line]. Provo, UT, USA: Ancestry.com Operations Inc, 2008. 3. A photo of Freeman titled, “Landsman Freeman D. Briggs, U. S. Navy,” is on the Oshkosh Public Museum website http://oshkosh.pastperfect-online.com/20004cgi/mweb.exe?request=record&id=DFBEA0AE-F651-461E-AC54-535412244081&type=102, and notes say that, “Freeman served onboard the Osage.” Wikipedia tells us that “the USS Osage was a single-turreted Neosho-class monitor built for the Union Navy during the American Civil War.” More information about this vessel is available at https://en.wikipedia.org/wiki/USS_Osage_(1863). 5. And, using information from source four, we located a digitized image of Freeman’s death certificate on the FamilySearch® website at California, County Birth and Death Records, 1800-1994, index and images, FamilySearch, Los Angeles, Long Beach > Death certificates 1920 nos. 400-790 > image 327 of 424. RESEARCH TIP: Tombstones don’t always tell the full story (and even when we think they do, they are often incorrect!). Dig creatively in many sources to reconstruct a simple life chronology for any relative whose stone records only the years of birth and death. Several graves at Sunnysude Cemetery have photo memorials embedded in their granite markers. 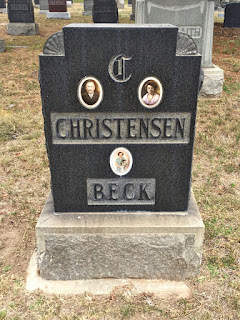 This is the resting place of Martin Christensen, his wife Marie Christensen, and their daughter Julia Marie Christensen Beck. From information recorded on their death certificates, we learn that Martin and his wife were born in Denmark and that they followed naming patterns common in Scandinavian countries: Martin’s father was Chris[ten] Mortensen; so, Martin’s surname became Christensen (Christen’s son) not “Mortensen.” The couple came to Long Beach in the early 1920s from Iowa, and both died in 1933, at the age of 81, Martin on January 17th and Marie on March 12th. Martin was a retired blacksmith, and he and Marie had lived at 370 Wisconsin Avenue in Long Beach for 13 years. Digitized images of their death certificates can be found at “California, County Birth and Death Records, 1800-1994,” database with images, FamilySearch: Los Angeles, Long Beach > Death certificates 1933 no 1-1559 > images 96 and 406 of 1677. “photodetective,” a blog written by Maureen A. Taylor, on her post for Monday, February 13, 2012, at http://blog.familytreemagazine.com/photodetectiveblog/2012/02/13/PhotographsOnWhoDoYouThinkYouAre.aspx. 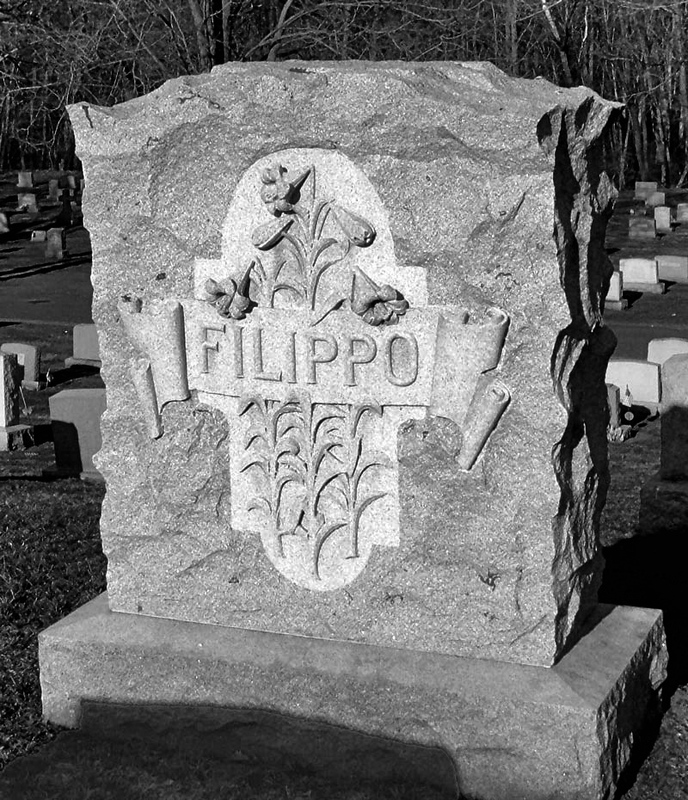 RESEARCH TIP: Photographs, Daguerreotypes, and ceramic memorial pictures and plaques attached to stone grave markers are relatively rare because they do not stand up well to the elements. 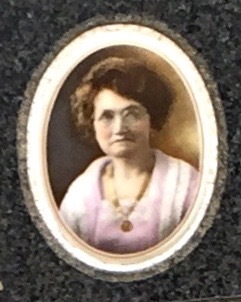 Vandals often destroy them, and, sadly, even some family historians have been known to pry memorial photos off gravestones, rationalizing this activity by saying, “But it’s the ONLY picture I’ll ever have of my great-grandmother.” When you visit a cemetery, please leave all gravestones as you found them. You can keep the information they contain by taking pictures of them. 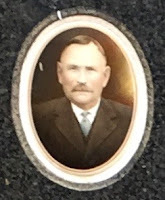 If you see a particularly beautiful marker with a photo embedded in it, take a picture of it to preserve it for the future, even if it isn’t anyone in your family. Then do a Random Act of Genealogical Kindness and post it on Find A Grave or on another cemetery site, so that relatives may find it there. Four Questing Heirs members attended the Genealogical Society of North Orange County California’s seminar in Yorba Linda today where F. Warren Bittner taught us how territorial boundaries affect German research; how complex evidence can lead to solid conclusions; how information on a census page can provide the foundation for an advanced research plan; and, how thinking outside the box can open up new avenues of research in archives and libraries. 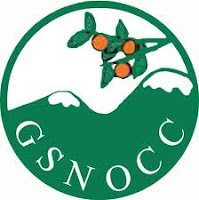 Two of us won door prizes, and we each received a plastic glass with the GSNOCC logo on it because we registered early. It was a great day! 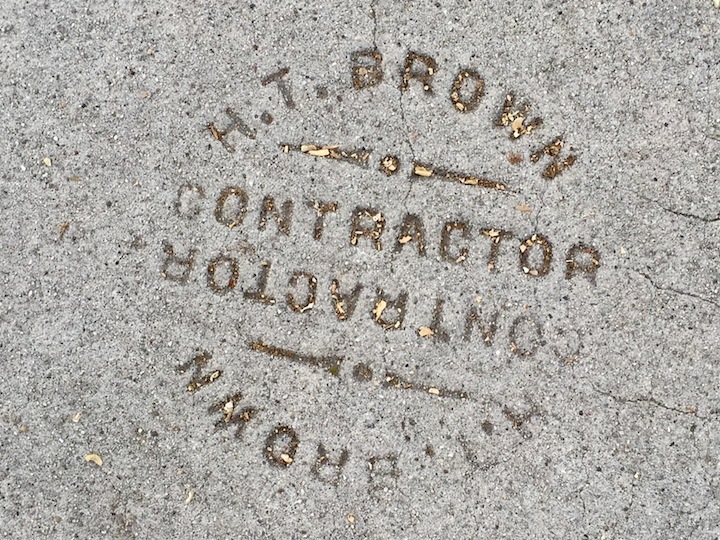 Harry T. Brown was a cement contractor who lived in Long Beach at 139 Linden Avenue in 1922 with his wife Anna. Address Source: Long Beach City Directory 1922, Western Directory Company: Seaside Printing Co., Long Beach, California, ©1922. RESEARCH TIP: When you search for ancestors in the “householders” section of a city directory, don’t forget to look in the business listings for information about their place of employment, too. There may be a picture or engraving of the building where they worked. Many thanks to all our blog readers who have waited patiently for the QHGS computer problems to be resolved. Fortunately, the computer’s hard drive was salvageable, files were transferred to a new lap top, and the blog will begin publishing again tomorrow. 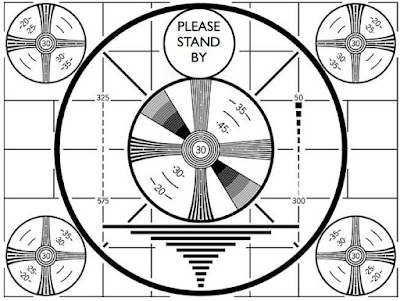 Due to technical difficulties (your faithful blogger’s aged Mac ProBook17 blew a graphics card on July 5) the QHGS Blog will not be publishing posts for a few days. 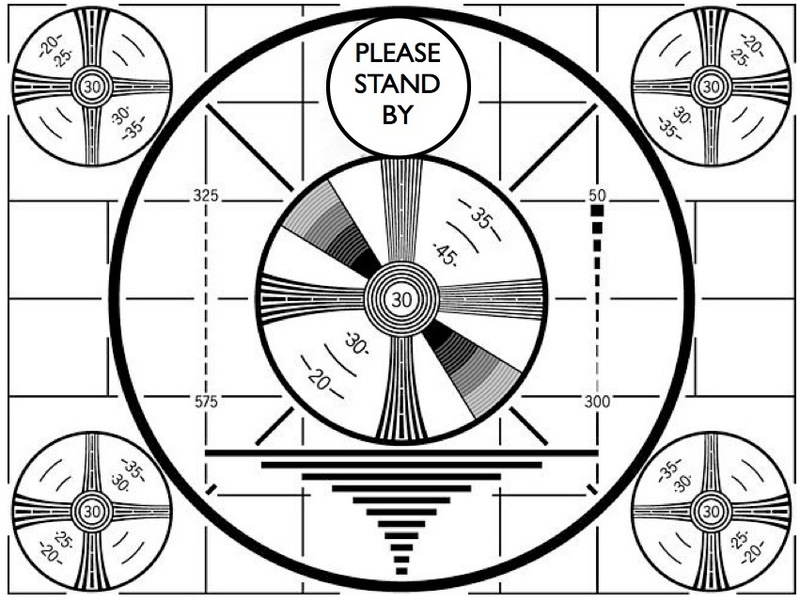 We hope to be up and running soon and thank all of our readers for their patience. Why do some gravestones look like tree trunks? Does a beehive on a headstone mean the deceased was an apiarist? Why are so many tombstones decorated with lilies? As we walk through cemeteries looking for the graves of our ancestors, these and many other questions come to mind. Fortunately, there are websites available to help genealogists of today understand symbols carved on grave markers of the past. Grave Addiction at http://www.graveaddiction.com/symbol.html has an alphabetical list of common symbols illustrated with photographs—a nice touch if you don’t know what an acanthus leaf looks like! And you can download a free pdf, “Tombstones and Their Stories,” at the Washtenaw County Historical Society website: http://washtenawhistory.org/images/tombstone_symbols_v8.pdf. Read it carefully, and follow Judy’s advice. 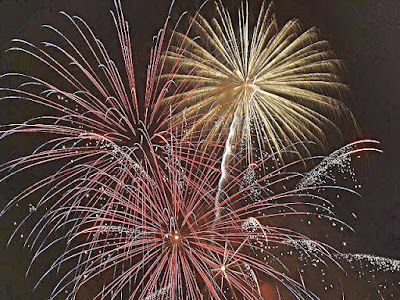 The Questing Heirs Genealogical Society of Long Beach wishes you a happy Independence Day. 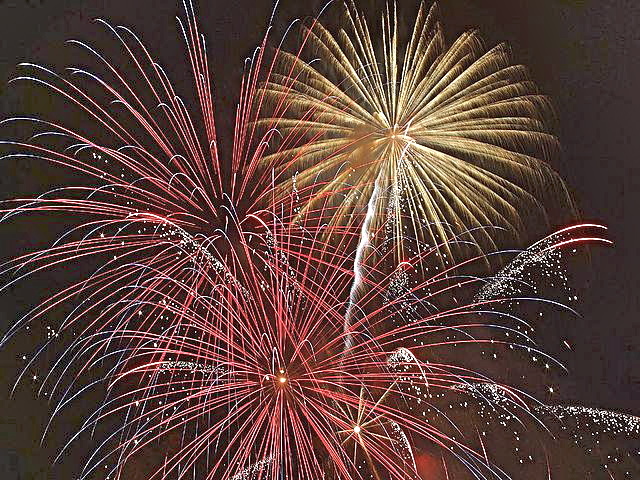 RESEARCH TIP: Read old newspaper articles to find out how your ancestors celebrated the Fourth of July. During the 1930s in our city, it was common for people to spend their holiday at the beach. Fireworks were shot off over Rainbow Pier in the evening, and many families picnicked in Bixby Park. The unveiling, dedication and presentation of the Abraham Lincoln G.A.R. 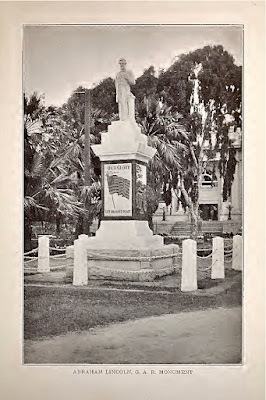 memorial monument dedicated to the veterans of the Civil War occurred on July 3, 1915, in what was then called Pacific Park. Download a FREE pdf of the 98-page pamphlet, Souvenir of the Unveiling, Dedication and Presentation of the Abraham Lincoln G.A.R. 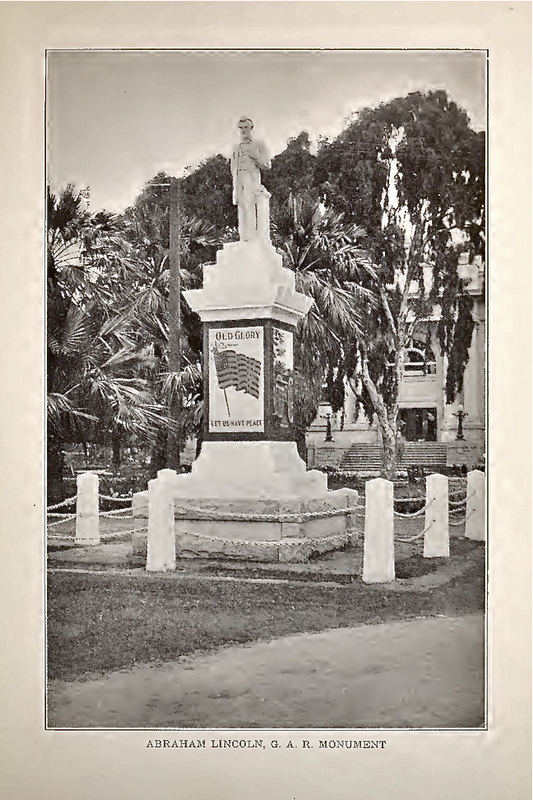 Memorial Monument Dedicated to the Veterans of the Civil War—1861-1865 at Long Beach, California, at https://archive.org/details/souvenirofunveillong. This booklet contains a wealth of information and has many photographs. It lists the living G.A.R. members of the Grand Army of the Republic, Department of California and Nevada, Long Beach Post 181, as well as the veterans who had lived in Long Beach and belonged to post 181, but who had passed away before July of 1915. Also included are a list of the officers and members of the Woman’s Relief Corps, Auxiliary to Long Beach Post No. 181, Department of California and Nevada, and a list of the officers and members of Sons of Veterans Auxiliary No. 1 to Henry W. Lawton Camp No. 11, Long Beach, Department of California and Nevada. The “Blue and Gray” club is mentioned, too, and a photo of the drum corps is included. Characterized as “the only known organization of its kind in existence,” the club was organized in 1910, its members being ex-veterans of both the Confederacy and the Union. RESEARCH TIP: The Internet Archive has all kinds of genealogical resources available in text, video, audio and image formats. Don’t make the mistake of thinking that this site only has books! On the home page at https://archive.org/index.php, click the “image” icon (two little photos) in the upper left-hand corner of the page to look at U. S. Geological Survey maps of all 50 states; click the “audio” icon (old-fashioned stereo speaker) to find free audiobooks, old time radio shows, and podcasts; view instructional films, home movies, and historical footage by clicking the “video” icon (strip of film) and choosing “Prelinger Archives” at the top of the page; and of course, you can certainly click on the “text” icon (open book) which is where we so often end up, having been sent to a particular volume by Google. Give the other media databases a try—you won’t be disappointed. It describes Fletcher as an oil driller’s helper, tells where he lived in the city, and states that he died, aged 18, at Seaside Hospital from burns suffered in an oil field explosion. It also tells us that his body was shipped out of state to be buried in Texas where his parents lived. RESEARCH TIP: It is very important to research every child in a family—not only the child who is your direct ancestor. Fletcher Bownds is a good example of this. Although he was unmarried and probably died without issue, he may have had siblings who did marry and who carried on the family name in Texas. 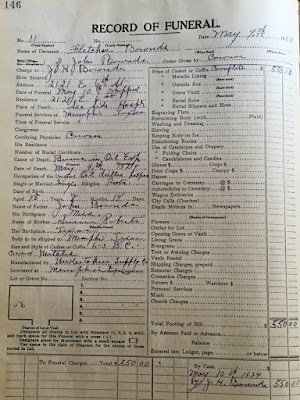 If you were a descendent of one of those children and did not know the maiden name of their mother, reading Fletcher’s funeral record would supply it. Type “oil” in the search box on this page, click “search,” and you will find more than 60 interviews with pol field worklers with extensive biographies attached to each one. Click on the link above, and you will see a large photograph showing five oil field workers as well as the Union Oil Company’s “Classification and Wage Scale of Oil Field Employees.” The photo has four readable surnames written on it: Horne, Wilson, Sullivan and Roneok. 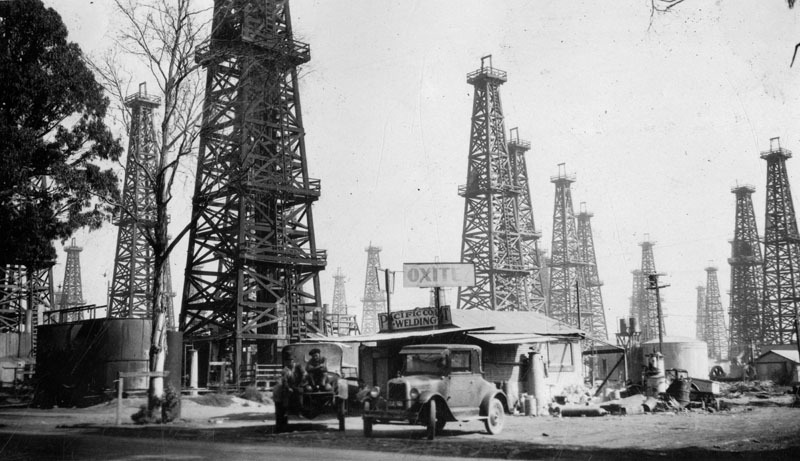 This website has an article about the Signal Hill oil boom. A very good overview of the petroleum industry in Southern California is available on this website. A transcribed newspaper article re: the Long Beach Richfield oil refinery explosion of June 2, 1933, can be found here. Pictures of the event are included, and the names of the dead are listed. A newspaper article about an earlier oil well gas explosion which killed E. H. and H. H. Hanley, brothers, and H. S. Clark, on March 1, 1931, in Long Beach, is also posted on this site. This site has 1 minute and 27 seconds of black and white film footage that shows the Richfield refinery fire of 1933. RESEARCH TIP: Remember to include audio resources when you search for information about your ancestors. Oral history projects are becoming popular, and many local universities and libraries have interviews available with old residents who live in the area. Some of these interviews are on cassette tape, some are available as transcriptions, and some have been digitized as podcasts.